When asked to name a socially responsible organization, people were more likely to point to for-profit companies like Microsoft and Starbucks than nonprofit charities, according to a recent survey. For the survey, conducted online, 1,021 Americans were asked to name a company or organization that is socially responsible. The companies that ranked the highest were the ones named most frequently by respondents, and their answers were kind of all over the place. Leading the pack was Toms, the 9-year-old retailer known for its one-for-one business model -- buy a pair of shoes (or eyeglasses) and the company gives a pair to a child in need. “Before Toms was founded no one had any idea what a socially responsible company was,” said Heath Shackleford, the founder of Good Must Grow, the marketing consultancy that commissioned the survey. His firm seeks to help socially responsible companies market their causes to shoppers. Shackleford said the reason some of these for-profit outfits had a higher visibility than the nonprofits could’ve been that the survey focused on questions about companies with charitable missions. Still, he said, he was surprised by the results. It makes some sense that Starbucks and Whole Foods came out on top -- both are known for progressive policies when it comes to their employees, offering health care and tuition assistance, among other things. And perhaps respondents conflated Microsoft with its founder Bill Gates, who runs the biggest charitable foundation in the world. Other companies that made the ranking include retail behemoth Walmart and Chick-fil-A, which a few years ago was in the spotlight when its CEO spoke out against gay marriage. The top-ranked charity on the list, the Red Cross, is no stranger to controversy either. It came under fire last year over charges that it put public relations ahead of charitable work. Still, there's clearly a big knowledge gap around the idea of socially “responsible” organizations. 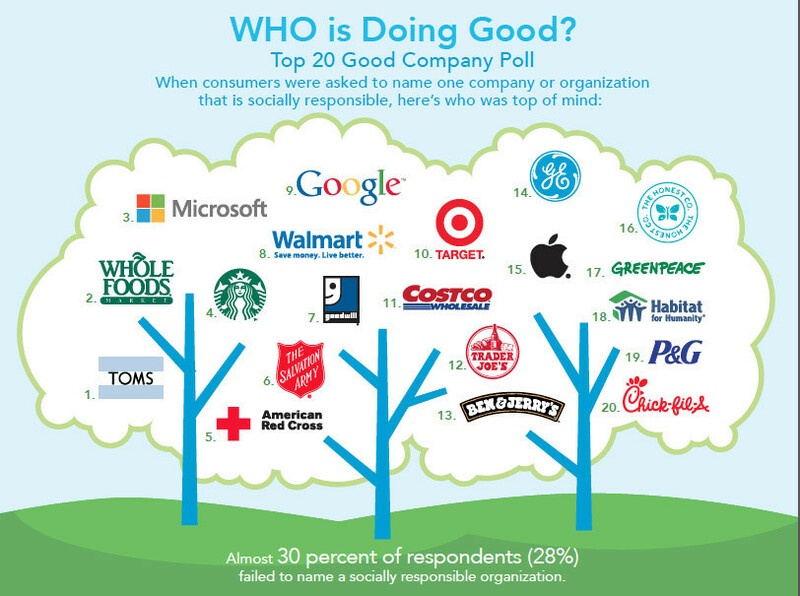 A full 30 percent of the survey respondents couldn’t name a single socially responsible company or business at all.